The '09 DCI Tour... It's Electric! 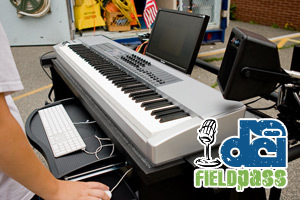 This year marks a major change in competitive drum and bugle corps with the addition of electronic instruments. Will it be a creative dream spawning new sonic textures and exciting innovations? Or will it be a technical nightmare of strange noises and odd distractions? DCI's Dan Potter examines those questions and has the full rundown of this weekend's step-off to the 2009 Drum Corps International Tour in today's Field Pass. View the complete '09 DCI Tour schedule.